"In a Dallas state Senate district held by the GOP for decades, incumbent Don Huffines is in a tight race" was first published by The Texas Tribune, a nonprofit, nonpartisan media organization that informs Texans — and engages with them — about public policy, politics, government and statewide issues. In a Dallas state Senate district held by the GOP for decades, incumbent Don Huffines is in a tight race By Alex Samuels October 24, 2018 DALLAS — Four years ago, state Sen. Don Huffines, R-Dallas, claimed victory in a nail-biter of a GOP primary race against incumbent John Carona, ousting a fellow Republican who had served a whopping six terms in the Texas Senate. With no general election opponent, Huffines coasted to the Legislature, and by all appearances, seemed safe in his seat for years: Senate District 16 has been represented by Republicans for more than three decades. Huffines has the backing of Republican Gov. Greg Abbott. He’s raised more than $1.3 million since the start of 2017. But with mere days until Election Day, Huffines’ re-election is no longer seen as sure-fire. In fact, based on his district’s recent voting history, he’s emerged as one of the most vulnerable senators in the Legislature and is one of three sitting Republicans whose seat in the upper chamber is considered in play. “Dallas County is a little more competitive than it used to be, but I’m confident the voters will send me back to Austin,” Huffines said at his campaign headquarters on a stormy Saturday morning this month, roughly an hour before he joined his wife Mary Catherine to deliver yard signs and block walk. “I really do believe that our best days are yet to dawn.” When Huffines and his wife made it outside — the former sporting a puffy orange rain jacket and clutching a blue tote bag holding campaign paraphernalia — the senator immediately started knocking on voters’ doors. (He even made a stop at one house with a black-and-white "Beto for Senate" yard sign in the front yard.) Huffines represents northern Dallas, an area that has become the epicenter of competitive races in Texas this year. And he's facing challenges he didn’t have four years ago: a general election challenge from Democrat Nathan Johnson and changing local demographics that have some fearful that a "blue wave" could overwhelm the district. 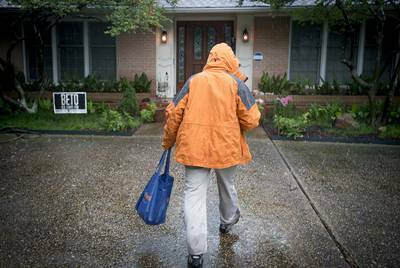 State Sen. Don Huffines, D-Dallas, walks through the rain to knock on a door where a U.S. Rep. Beto O’Rourke supporter lives on Oct. 13, 2018. Robert W. Hart for The Texas Tribune “You’ve got non-Texans moving in from the rest of the country and then you have increasing diversity in those districts, which means that they’re still Republican-leaning, but in a good Democratic year these districts can go either way,” said Cal Jillson, a political science professor at Southern Methodist University. Johnson, a Dallas lawyer and political newcomer, is hoping to gain support from across the ideological spectrum — including a surge of enthusiastic Democratic voters and moderate Republicans — to win the district. “I don’t think it’s just a tide of anger. I think it’s a rising tide of moderates from anywhere along that middle part of the spectrum,” Johnson said at a Top Pot Doughnuts in Dallas. “This is a really productive district and people are tired of unproductive agendas and unproductive legislative sessions. A large part of this blue wave isn’t necessarily blue — it’s just a wave.” An established name Some Republicans familiar with Dallas-area politics say there are a million reasons why Huffines shouldn’t be in trouble. For one, his name ID precedes his time at the Texas Legislature: He comes from a family that’s been involved in business in neighboring Collin County and the surrounding areas for more than 90 years. “Huffines” is a brand itself — one that’s been stapled onto real estate and car dealerships throughout the North Texas region since 1924. In 1985, Huffines and his twin brother, Phillip, started Huffines Communities, one of the largest real estate land development companies in the Dallas-Fort Worth area. And the senator made a name for himself in politics during his first term. Perhaps his biggest victory — and one he touted to Dallas residents while knocking on doors — was a crusade against the Dallas County Schools bus agency. Amid reports of financial mismanagement at the agency and drivers not getting students to school on time, Huffines helped lead a push in the Legislature for a county-wide vote on whether the agency should be disbanded. Huffines donated $129,000 of his own money to a PAC he founded in favor of shutting the agency down. The shut-down vote prevailed, and Dallas County Schools board president Larry Duncan has since pleaded guilty to tax evasion. He faces up to five years in prison. “When you want to make sure you end corruption and abuses by institutions that are, essentially, very much left-leaning, then the person who is going to take than on — because he’s got the got the transparency and the integrity to do so — that’s Senator Huffines,” said Missy Shorey, the Dallas County Republican Party chairwoman. Even after last year’s legislative sessions adjourned, the Huffines name continued to be in the limelight. In August, he received national attention after he, Phillip and U.S. Sen. Rand Paul, R-Kentucky, met with Russian officials in Moscow to “demand that Russia stop meddling in our elections.” A couple weeks after the trip concluded, Huffines called for a “Texas-style sanction against Russia.” The Republican incumbent also has a financial edge. In the last fundraising quarter, he received a $100,000 donation from Texans for Fiscal Responsibility PAC. In total, he reported raising $412,000 and having $491,000 cash on hand. Johnson, on the other hand, raised $248,000 and has $317,000 cash on hand. Aiming for moderates Despite the advantages working in Huffines’ favor, the senator said he’s “not taking anything lightly.” And a handful of external factors are at play that could impact his re-election bid. 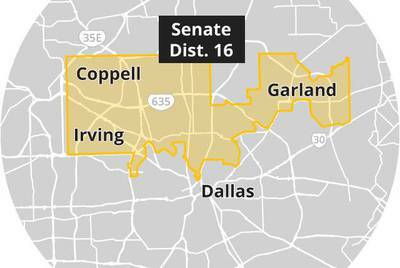 In Dallas County, Democrats are running competitive races for several legislative and Congressional seats that could impact returns for Republicans in the area. Then there’s the anti-Trump effect. “A lot of people are wanting to come out and wanting to vote against Trump,” said state Rep. Jason Villalba, R-Dallas, a relatively moderate three-term legislator who lost his GOP primary earlier this year. “What I’ve seen Huffines do is embrace Trump and embrace some of these very far-right positions that the Trump administration is advancing. I think that’s dangerous for him.” Johnson, meanwhile, is spending some of his time on the campaign trail emphasizing policy areas where he and Huffines don’t see eye-to-eye. In an interview with The Texas Tribune, Johnson said he’s a strong opponent of the “bathroom bill,” which he called a “colossal waste of time and a political stunt at best.” (Huffines was a co-author of the measure, which would have restricted the use of certain public facilities for transgender Texans.) Looking ahead to next year’s legislative session, Johnson said school finance is at the top of his mind. Specifically, he wants to look at how to better fund Texas’ public schools. He’s also hopeful Texas can move forward on Medicaid expansion — something he calls “conservative” since more than 30 states have already done it. “Economic progress and social progress go hand-in-hand,” Johnson said. “That’s the message that reaches both sides.” Huffines has also been snubbed by fellow Republicans with ties to his district. Earlier this month, Johnson picked up an endorsement from former state Sen. Bob Deuell, who was unseated in 2014 by fellow Republican Bob Hall of Edgewood. 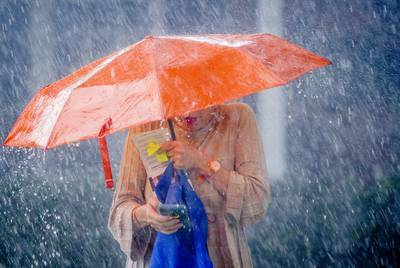 Mary Catherine Huffines, wife of Texas state Sen. Don Huffines, R-Dallas, walks through a rainstorm to campaign for her husband on Oct. 13, 2018. Robert W. Hart for The Texas Tribune “His demagoguery has prevented him from effectively representing his constituents and the people of Texas," Deuell said of Huffines. “Mr. Johnson and I do disagree on pro-life issues as well as some Second Amendment issues, but he is clearly the better candidate." Carona, Huffines’ 2014 primary opponent, told the Tribune he was “not endorsing either candidate in the SD-16 race.” Huffines has tried to focus on his past legislative victories — emphasizing that he’s the only candidate who has the resume that proves he can adequately represent the needs of his constituents. Heavy rain and damaging winds cut short his Saturday morning block walking, but he pushed that message as much as he could. “What are some of the talking points [we use] if we find someone who’s on the fence and could vote either way? How would you reach them?,” asked a supporter donning an orange and blue “Huffines” scarf before they set out into the rain. “You’ve got to reach them by telling them that property taxes are too high. I’ve got the record to prove that I’m supporting property tax relief,” Huffines answered. He stood atop a large blue cooler and had a bright orange “Don Huffines” poster plastered to the wall behind him. “You’ve got to reach them with the fact that we’re going to have the best school system in the world. We’ve got the best districts in the state and that makes them the best in the country.” A changing district Perhaps the biggest threat to Huffines this year, however, may be the changing demographics of his district. Jillson, the SMU professor, said that in a cluster of North Dallas cities, including Farmers Branch, Irving, Rowlett and Garland, the population is booming and becoming more diverse — with people who lean Democratic moving into the area. Uptown, which neighbors downtown Dallas, is home to a horde of young professionals who often favor Democrats. “The Huffines-Johnson Texas Senate district … and all those Texas House districts were drawn as Republican districts in 2011 and have performed that way,” he said. “But the Republican advantage begins to blur as the demographic changes continue.” Despite a Republican state senator holding the seat for more than 30 years, the district has been inconsistent in how it has voted at the top of the ballot. In 2010, it voted for Democrat Bill White over incumbent Republican Gov. Rick Perry by 12 percentage points. Two years later, it swung to Republican Mitt Romney, who won the district over President Barack Obama by 15 points. Then it swung back to Democrat Hillary Clinton, who edged Republican Donald Trump by 4.6 percentage points in 2016. Johnson said he believes the shifting demographics will work in his favor. “You have people moving in from other states who identify as fiscal conservatives and social liberals,” Johnson said. “In addition you have many conservative voters moving out of the district and younger people moving in. Those kind of voters, I think, want nothing to do with the extremist right wing and I think those voters come in my direction.” Also working to Johnson’s advantage this year is enthusiasm among Democrats in other races. Aside from the obvious fanfare surrounding Democratic U.S. Rep. Beto O’Rourke’s U.S. Senate run against Republican Ted Cruz, Senate District 16 overlaps with the 32nd Congressional District, where recent polls show incumbent U.S. Rep. Pete Sessions in a neck-and-neck race against Democrat Colin Allred. “There are Beto signs all over Dallas and I grew up in Dallas,” said Carol Donovan, chair of the Dallas County Democratic Party. “It was a real shock to me to see so many Beto signs in the Highland Park and University Park areas — both of which were areas that, when I was growing up, you never saw a Democratic sign here.” To be sure, the changing demographics of Dallas County aren’t lost on Huffines. But as he told a jubilant crowd of roughly 70 supporters earlier this month, he thinks the majority of his 900,000 constituents are — for the most part — happy with how things are going. “I just don’t think that’s going to happen,” Huffines said of a potential “blue wave” hitting his area. “This is competitive and I’m doing everything I can to win. We’re running a full-blown campaign. I’m not taking it lightly, but I’m still confident.” Disclosure: Southern Methodist University has been a financial supporter of The Texas Tribune, a nonprofit, nonpartisan news organization that is funded in part by donations from members, foundations and corporate sponsors. Financial supporters play no role in the Tribune's journalism. Find a complete list of them here. Read related Tribune coverage With a supermajority, Republicans have complete control of the Texas Senate. That's at risk this election cycle. Analysis: The Texas Senate’s Republican supermajority, on the bubble State Sen. Don Huffines meets with Russian officials in Moscow "In a Dallas state Senate district held by the GOP for decades, incumbent Don Huffines is in a tight race" was first published at by The Texas Tribune, a nonprofit, nonpartisan media organization that informs Texans — and engages with them — about public policy, politics, government and statewide issues. Link back to the original article, which is located at https://www.texastribune.org/2018/10/24/don-huffines-texas-senate-nathan-johnson-midterm-elections/.